How can i up my vehicle paint game? So I've painted up 4 venoms, 2 raiders and 1.5 ravagers but I'm not entirely happy with them. 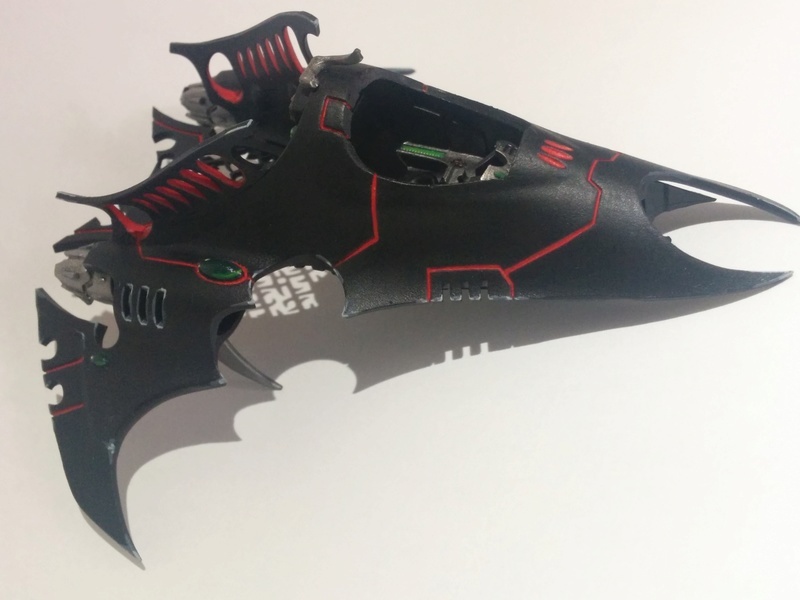 I like my paint scheme; it looks great on smaller models, however i feel it leaves the vehicles... missing something. I recently threw some highlights on 1 venom, more on 1 side and less on the other. I like the side with less, but it still isn't right. I'm at a loss of what to do. I'm wondering what you guys might suggest? Aside from adding the guns, a pilot and a windshield, what should i do? 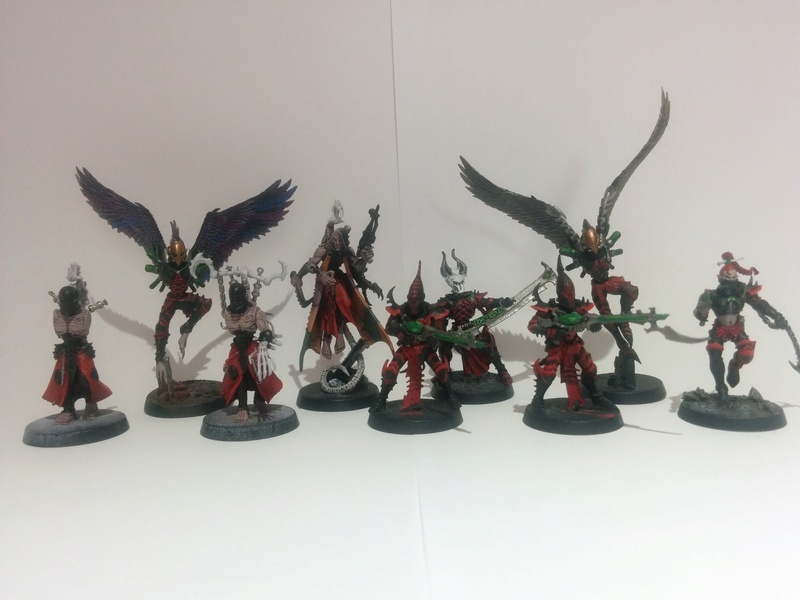 Could you post a pic of one of your kabalites/troops so we can see why you think it looks better on smaller models than vehicles. I mean, a super easy way to make it stand out more would just be to line the whole outside of the thing with the same shade of red you filled the gaps in with. I can see you've done so in a grey but it would certainly stand out more in red. Again... I think it would be helpful to see your smaller stuff that you're happy with to compare what you should do. But to be honest it looks quite nice so far anyway. Highlight all edges of the upper surface of the hull with your grey/white highlights, including the edges bordering to your red grooves. Continue what you did with the red on the railing, paint everything red that's not the upper surface of the hull. As if the hull is only red on the inside. That could give your already unique scheme consistency. Or, you go Obsidian Rose style, with red edges and black grooves. Look @Mortarion's Project log for examples. Edit: I really like the look of your gems, top notch! Here is a sampling of my other models. They are all WIP to varying degrees... Scourges need some accessories painted, Wracks and the Hemi need red highlights on the armor bits like everyone else and accessories/weapons, i want to clean up the lines on the Kabalites (my straight thin line skills have increased 10 fold since i did these), i like the Incubi but want to redo his cloth bit (its shiny?!) and the Wych... was the first model i ever painted, so lets not even get into that (it doesn't look as bad in the picture). I think the paint scheme looks better on them because there is less surface area. The big panels on the vehicles result in a lot of black-space. I like the typical theme people do with the edge highlights on the panels but i wanted to do it a bit different, and i do like my tron lines, its just more plain which is causing me grief. Since you both have vouched for more red, i think i'll give that a try. I was worried about doing it because i thought it would be too much and i spent so long getting to this point (way longer than it should have taken) and i didn't want to mess it up. I know i wanted 'more' but i thought more red would be 'too much' and be distracting or something. I thought someone might have a better idea lol but i guess i just need to go for it. 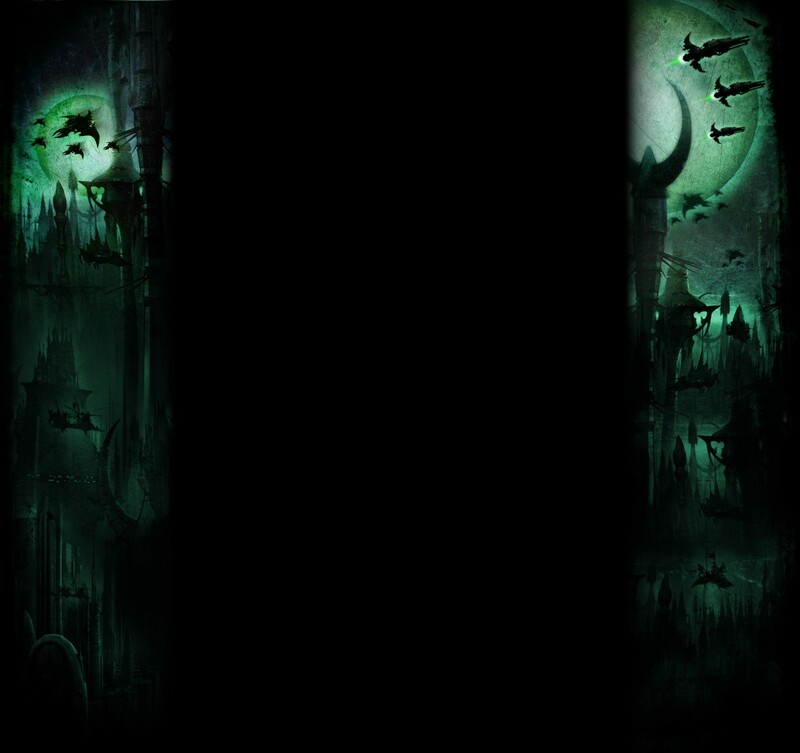 I'll also add more of the grey to the top of the panels. Your image doesn't load @Marrath but i bet it was pretty awesome! Thanks @Cherrycoke and Marrath for the suggestions! I'll post a pic when i paint it some more (probably tomorrow). PS: Thanks for the gem comment my gems are probably the only thing i've painting that i'm actually proud of! I see now what you mean, certainly your vehicles would look quite different with the large slabs of black than how you've painted your smaller things. 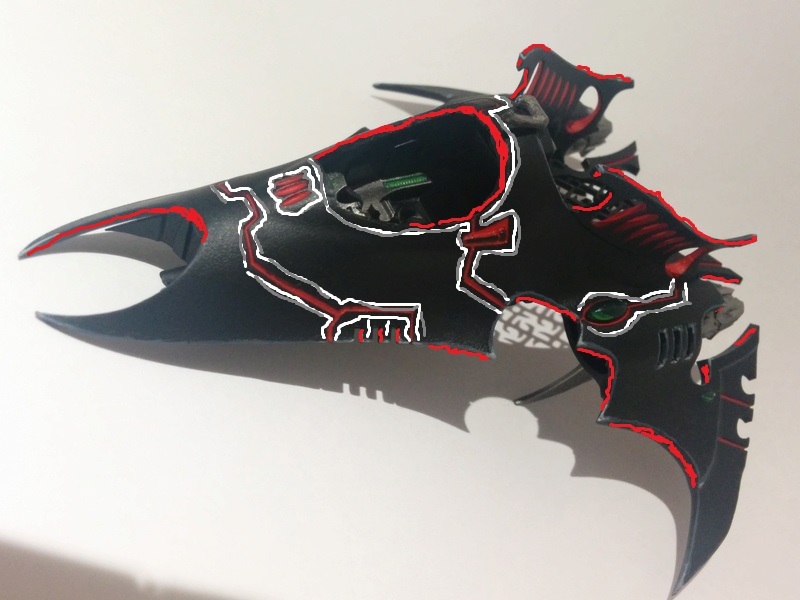 My fave idea would be to break up the large surface areas of black on your vehicles by... if you have a steady hand or you can get your hands on a stencil that would suit an eldar theme (Available from ebay or Fallout Hobbies) you could break up those big slabs of black with red decals, if done right it could easily make a big difference. I'd also go over your grey lining of the black with a slightly brighter and less subtle shade. I'm far from a painting expert but it might be better if you were to leave the grooves in your vehicle hulls black and line the edges of the grooves in red instead. That's certainly what I did with my own vehicles and I'm reasonably happy with how they look. Your image doesn't load @Marrath ! @Count Adhemar while i do like that look (i was actually looking at your venom before i posted on here) i wanted to do something different, hence my groves became colourful. @Marrath haha thats great. Almost what i ended up doing too! Boy what a weekend. Painted a venom (left most, like Marraths image), during which all of my paint brushes started splitting on me and i ran out of paint. I ended up liking the red, but the highlights felt like they distracted from the red too much. Next day i bought new paint and new brushes and painted the second venom with less highlights (middle). It went horribly and i ended up redoing it later that evening. It still didn't feel quite right, the highest highlight just looked like dots all over the place. Then the air brush broke and there was another trip to the hobby shop. Sunday i painted up the third venom (on the right) and while its still simple i did like it. I think i'll try the 'eldary looking markings' on the side, like @Cherrycoke suggested next. Lessons learned from this exercise: Just go for it - i was so worried about 'messing up' the models that i didn't want to try but it ended up being the best thing to do. And the importance of rinsing brushes in-between paint colour changes. Anyways. Thanks for the help and suggestions everyone! Haha you've really picked a tough scheme by choosing black! Pure black is hard to work with because you're at the extreme end of the lightness gradient. You can't use washes or other cheap tricks for easy shading so you end up with a kind of flat look to the chassis of the model. Because minis are so small you need to exaggerate the lighting so that the details pop out on the tabletop. I think going for a grey would look really bad. If you want to do this you'd have to abandon the jet black look and go for say a dark blue, grading up to a mid blue. 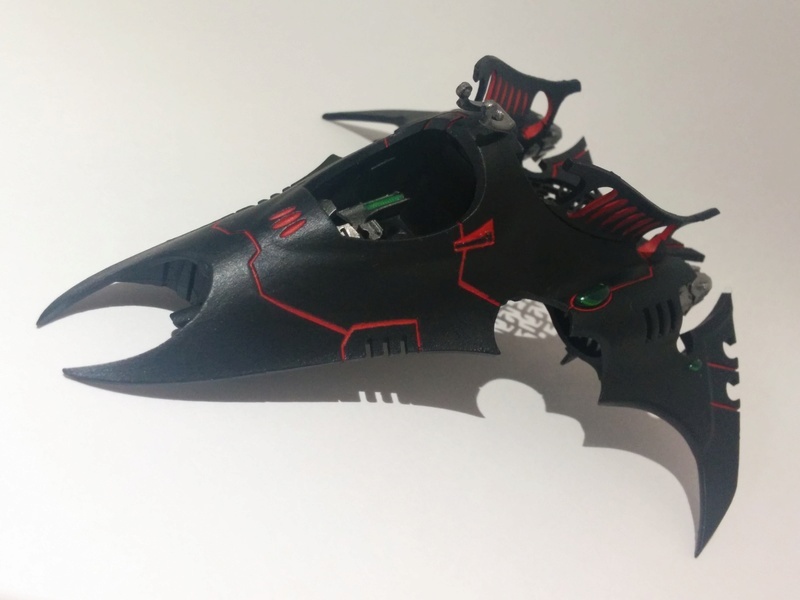 The easy way to do it is with an airbrush. The hard way is to paint on lots of layers of thinned down paint working up to smaller and smaller areas. Starting from black you could achieve a kind of midnight blue which would look great but would take a long time. Another idea would be to get some acrylic gloss varnish and just gloss the models. This would give a really distinctive laquered look kind of like a beetle. 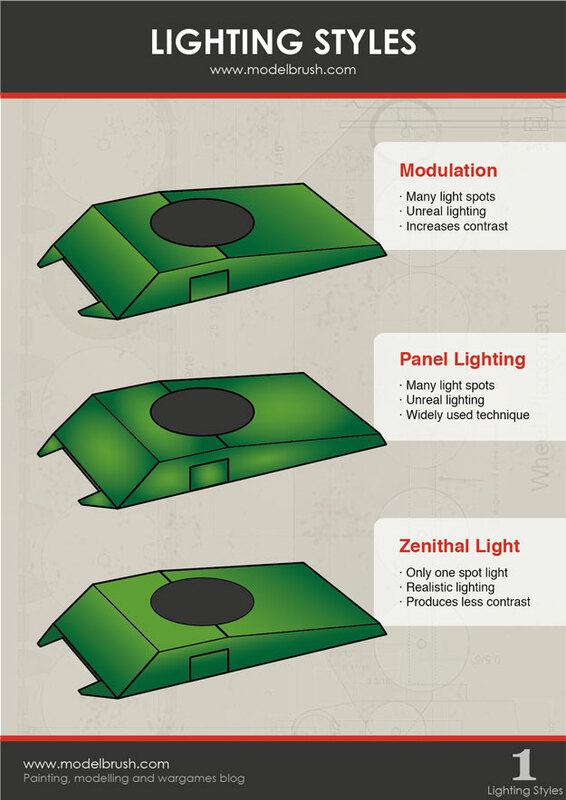 You'd get a lot of free lightness modulation from the reflected light for a lot less effort. Subject: Re: How can i up my vehicle paint game?